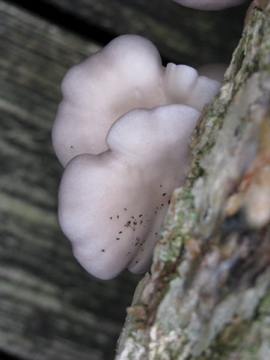 At the end of March we attended a mushroom log workshop hosted by Janell Baran at Blue Owl Hollow Tree Farm near Newark. Janell told us that it would probably take a year before we saw any mushrooms appear. 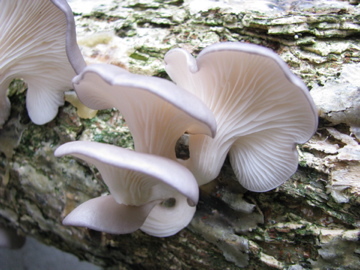 Imagine our surprise and delight when we ventured outside between rainstorms last week and found our first crop of blue oyster mushrooms. We picked them before any of the slugs and squirrels that have eaten everything else in the garden had a chance and I plotted how best to enjoy them. I love mushrooms sauteed in butter but there weren’t really enough for two, so I splashed out and bought some wild mushrooms from the Greener Grocer to add to them. Colleen had just had a delivery of beautiful chicken of the woods mushrooms, fittingly from Janell and I couldn’t resist trying them. 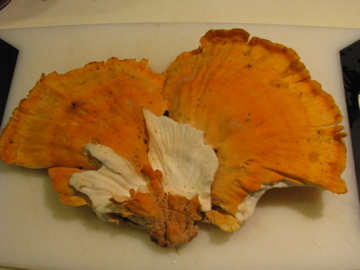 I had never eaten chicken of the woods before although I am sure I have seen it growing near the bike trail. Also known as Sulphur Shelf due to their shelf like formation they have a spectacular orange color . All the books warn that you have to cook them well as raw they can cause intestinal distress so we proceeded with some trepidation. 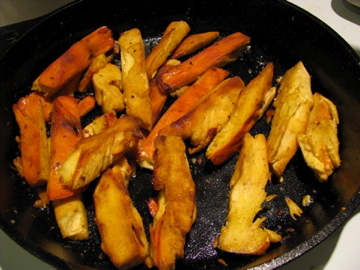 We sauteed them in our Snowville Creamery homemade butter and were amazed at how much they soaked up. Unsure how to tell if they were completely cooked we kept adding more and more butter. Usually mushrooms start exuding liquid as you cook them but these kept their firm texture and acted like a sponge. As an aside Janell recommended the book ‘Abundantly Wild: collecting and cooking wild edibles in the Upper Midwest’ by Teresa Marrone and I have found it a valuable reference guide for mushrooms, pawpaws, herbs and all sorts of foods that you don’t find at the grocery store.